The regular occupancy for 7202 is 2, however 2 additional people can be accommodated on the trundle bed in the living room. The regular occupancy for unit 7201 is 2. The regular occupancy for 7201/02 is 4. The maximum occupancy for 7201/02 is 6. Guests are obligated to disclose the actual number of occupants prior to arrival. A $250 security deposit is required with this reservation and we will process a credit card authorization in that amount prior to your arrival. This authorization will expire after your departure assuming no damages or fines are incurred. A charge may result for damage to the condo, missing contents or for exceeding the stated number of overnight guests.If a guest arrives without notice earlier than the scheduled check in time of 3pm or fails to depart by the required 10am checkout time, their security deposit which is on hold will be charged in full. Our units hold very busy time lines and the failure to leave on time can cost money and schedule disasters. Likewise arriving earlier than scheduled can disrupt the busy cleaning flow, cause mishaps and confusions with the housekeeping staff. Damage in excess of the $250.00 security deposit will additionally be charged to your credit card commensurate with such damage. Guests are responsible for reporting any damages immediately to the property manager, Kristen Greene, at (808) 346-0386 or kristen@alohacondos.comAmenities provided by third-party vendors (for example utility companies or subcontractors) are beyond our control. We do our best to provide services such as cable television, fee-based internet, and resort telephones. Should these be unavailable for part or all of your stay we will do our best to help restore services, but ultimately cannot be held responsible. Should you absolutely require internet access we recommend you make arrangement for these services through a cell phone company. The location of the complex itself, and of this unit within the complex, are both excellent. Put it this way: a few of my favorite pictures from our week on Kauai were taken from the lanai of this unit! (mountain, ocean, and garden views) This unit is huge - the living/dining area has plenty of room to spread out without feeling cramped, and the bedroom is also quite large. The kitchen and bathroom are a decent size. I appreciated the "split" bathroom with the toilet/shower in its own room, so the sink/vanity/mirror could be used separately. Also, it was great to have a washer/dryer in the unit, which we used several times. The unit appears to have been recently remodeled, with very nice furnishings and appliances. The complex is great, convenient to lots of sights and activities, a nice walk (or shuttle ride) to the beach, with a beautiful main pool/spa, and wonderful lush gardens/grounds. We did not try the smaller pool, which is a shorter walk from the unit, because we just liked the size and naturalistic style (rocks, plants, waterfalls) of the main pool so much. All in all, a great stay and we'd be thrilled to stay here again. 1 bedroom 1 bath with full kitchen, living and dinning room. Can easily accomodate four guests with plenty of room to spare. We where a little bummed when we got to our condo and the dishwasher was broken. It was fixed by the end of our stay. The condo however is in desperate need of new bedding and pillows. Although the bedding is clean it must have been at least 10 years old. The bedding on the pull outs was even worse. We love Hanalei Bay Resort, but would probably stay in a different condo next time. We received your review for the condo 7202 at the Hanalei Bay Resort and do appreciate it. We are sorry that the dishwasher broke but as with all properties, these things happen and with service calls, parts ordered and parts installed it can take some time. All though it was down, this fix for island living was a really good turn around which is what we aim for if possible. The bedding for the master bedroom with the king bed is not that old. It actually has been replaced in recent years. We will have the pillows checked to see if need of replacement. My husband and I booked this condo somewhat last minute, and I have to say - we made an EXCELLENT choice!! The condo is huge, spacious, the 2 lanais offer amazing views of the ocean and nearby Hanalei and corresponding mountains. We saw multiple storms roll through and a rainbow over the ocean and mountains made our stay even more magical. The kitchen was well equipped and the bed and furniture was quite comfortable. The resort was lovely, though I do caution that this unit is far from the parking, lobby and down/up a hill so anyone with issues walking (knee problems, etc) may have a more challenging time going to/from. However - they have golf carts you can call to bring you to/from parking, beach, etc. We did not utilize them. The beach is shared with the St Regis and is a 5 minute walk down the paved resort path. We were pleasantly surprised with a welcome gift as well from Aloha Condos. Booking, communicating and staying were all very convenient and lovely. I would HIGHLY recommend this condo rental to anyone looking for a quiet, calm, relaxing vacation in Kauai. The resort is in a lovely location. Can't say enough about the concierge, Christian, for his help in booking golf tee times, our helicopter tour, and giving us basic advice on the beaches. The front office staff, and golf cart drivers were all great. The condo we stayed in is privately owned, so we had our own in-suite washer/dryer. The bed was very comfortable, and the view was phenomenal. The condo itself, overall, suited our needs, but could use a fresh coat of paint. We would stay here again. Thank you for your hospitality. Kauai treated us beautifully. This is a great and comfortable unit. Well stocked,clean, andperfectly located. Close to beach and resort pool. Very comfortable with all beach paraphernalia you need. Totally recommend over all other condo communities. Hanalei Bay resort is worth the money. One criticism. For twenty dollars a night resort fee the WiFi should be a good connection. It is the very slow and sometimes not connecting WiFi at the condo. It is better at the pool but You have to pay for the decent connection. Everything else great. Thank you so much for your review and letting us know about the things you appreciated about the unit such as the views, the beds and amenities. The washer and dryer in this unit have been replaced and have been back in service for a couple of weeks now. The location of this unit is the further from the parking lot which give it more privacy which is what lots of people like about it. If someone does not want to take the walk, a bell boy can take them in the golf cart to the unit whenever you want or take them back out. The foliage is thick in this area but the rooster are everywhere. If that is something that might bother you, you will not get away from it for the most part on the island but some people choose to get ear plugs which are very inexpensive. The owners of this unit have replaced the bedroom furniture in recent years and upgraded the bathroom and somethings in the kitchen. They also replaced the lanai furniture in recent years but the ocean salt does quickly damage to the metal furniture. We will have that looked at. I guess the bar/lounge on the property was closed down for about a week according to the front desk which we did not know about for some remodeling in the kitchen. They said it is back up and running now though. The breakfast buffet next door at the St Regis is amazing and enjoying the terrace and views makes it a whole experience. Overall we are glad you enjoyed and hope you can come back. We only spent two nights in condo #7202, but we wish we would have planned to stay longer. This unit has a large balcony spanning the width of the condo, and the views are spectacular! It was so enjoyable to start our mornings with a cup of coffee sitting on the balcony and to end our day there. This unit also has chairs, snorkeling gear, and just about everything else you would need for the beach. It has a full kitchen with a drip coffee maker, and they were nice enough to have coffee filters available. The Princeville Shopping Center is about a four minute drive, which is convenient. It has restaurants, grocery store, boutiques, wine shop, etc. I would not hesitate to rent unit 7202 again if we return to Kauai. We do appreciate your review and the great rating! The views do set the mood for a great stay in paradise! The condo as you said is accommodating and has all you will need. We are so glad you enjoyed and do want to come back. The most amazing view in all of Kauai is on the balcony of this second floor condo.A bit of a walk as it is the last building from the parking lot, but well worth it.Furnishings are a little dated, but the sheets were high quality. Only had one set of towels when there was supposed to be two sets in the room. The snorkeling on the beach was very good. We enjoyed our stay and would like to return. Thank you for taking the time to post a review for us for unit 7202 at the Hanalei Bay Resort. The views are very special and the location within the resort does allow for more privacy being down into the resort. I would mention that the bell boys with golf carts can take you to and from the condo if someone perferred. We wish you would have let us know that you did not get all your towels as we could have brought some more to you. Also sometimes in the past the guest did not look under the vanity where the rest of the towels are stored. We are so happy to hear you enjoyed and want to return. We look forward to having you as a guest again! The view from the lanai is one of the best in Princeville! We really enjoyed the live music at the pool and Happy Talk. The food was good too! The condo has amazing views, the pictures dont do justice. It had all the amenities we needed and more. The beach is walk-able and is so so beautiful, had a great sunset view. (The sunset from condo is amazing as well)The resort is good, quite and in a good neighborhood. I was wondering over Poipu stay or Princeville, I am glad I chose Princeville and this resort. Condo was clean and well maintained, there is complimentary shuttle pickup/drop-off provided by the resort as parking is at the entrance of resort. We do appreciate when our guests take the time to post a review. We do like the feedback. It is great to hear that you enjoyed your stay. The unit does have amazing views and the resort is in a great location. Thank you for mentioning the care of the unit was well maintained. We do hope you can come again in the near future! Beautiful views of Hanalei Bay and Mt. Views with sunset glow. Easy access to the beaches. Condo is in the amazing Hanalei Bay Resort. Great amenities, pool, hot tubs, bbqs are all incredible. Unit has decent location and an amazing view. Interior is a bit 1980s hawaii dated... could use a a refresh! Thanks for the review you posted for the unit 7202 at the Hanalei Bay Resort. This unit does have the most amazing views of the mountains, the ocean and the famous Hanalei Bay! There are lots of great amenities at this resort and thanks for mentioning it. These units are individually owned so the furnishings are a matter of taste. The bathroom in this unit, a couple of years ago, was remodeled with a new shower stall, new toilet and new tile flooring as well as new kitchen tile floors installed. The bedroom furniture and the lanai furniture had been replaces a few years ago also as well as new bed quilts. The interior paint was refreshed a couple years ago and the carpet was installed maybe about 5 years ago. The living room furniture is the furniture that was put in after the hurricane in 1992 but it is very durable, very sturdy and lots of unit at the resort still have these pieces. They are almost indestructable. 2nd time in 7202 was just as nice as the first. Don't change anything! We were at the resort before at another unit, and it was a splendid experience as well. Maybe the resort could build another hot tub???!!! We would love that! Great view of the ocean and you will hear the surf at night. Carts are available to get you to the unit since it is a bit of a trek from the parking lot down the hill and there are stairs to the second level. Nicely appointed if looking a bit aged. Bed was very comfortable and it was great to have the washer & dryer unit. Kitchen had all the basics although the light inside the fridge did not come on. Internet was very good. Good TV but get to bed early since the roosters will crow and waken you! We spent a week in this condo recently. Beautiful view, nice resort, but the condo had a few problems. The biggest problem was that the bed in the bedroom was way too soft and worn out. By the end of the week my back was in poor shape. In addition, the tableware and cutlery were rather limited and poor quality and the air conditioner in the living room barely worked. Thank you for taking the time to post a review for the unit 7202 at the Hanalei Bay Resort. The views from this unit are pretty amazing and the resort does have lots of great amenities. We are sorry that the bed did not agree with you. We usually do not have complaints about this bed but it is a very individual item as to what works for one or the other and therefore hard to please everyone. We will have someone check the inventory of the tableware as we did not know this was a problem. We wish you would have let us know about the air conditioner so that we could have had it serviced while you were there and got it resolved for your stay. We also have not since your stay had anyone else complain about it but we will now send someone by to take a look at it. Thank you again for your feedback as it is appreciated much. Really enjoyed the condo! We joked coming from SoCal that the apt was bigger than our own. Beautiful views from the lanai accessible from the living room and master bedroom. Slept great with the a/c. Due to humidity it gets hot without it. Full kitchen was nice too, although we only really used the fridge and microwave. A little bit of a trek to the unit, but the golf cart brings you to your car, beach etc if you like. Nice amenities with the complex- pool, Mai tai Monday's, tennis courts etc. Definitely recommend and I can be picky where I stay! Thanks for the rating of 5! We always do appreciate our guests taking the time to write a review. The views are pretty amazing from this unit and the spacious condo is very accommodating. This unit is far down into the resort which lends itself to a more private experience. As you mentioned though, the bell boys in the golf carts can take you to and from the unit or some might see it as a great opportunity for a bit of exercise. We thank you for your recommendations and hope you can come again also. The pool was great and you can walk to the beach from all the units. There is also a golf cart you can call to transport you to the bottom of the hill closer to the beach if you need it, but we didn't use carts except to get luggage to the unit. No complaints at all...worth it! We read your review on how you so enjoyed your stay. As you mentioned the views are exceptional! The direct access to the beach is a feature that most in Princeville do not have so it is a real amenity. The bell boys with golf carts do take and pick you up from the beach if need be. There is a phone at the bottom of the hill to call for the bell boys. Please join us again in your next trip to paradise! The condo is very spacious and has the right amount of furniture. The view makes this condo, it has an unobstructed view of Hanalei Bay and the surrounding Na Pali coast cliffs. The lanai stretches the length of the condo and you can enter from either the bedroom or the living room. One complaint about the furniture outside of the bedroom is that the recliners are too big for the space on the lanai. The kitchen is well appointed and easy to use. The resort is very nice, great main pool and a smaller secondary pool that is right next to the condo. They had just opened a new bar and parking was tight yet the resort personnel always accommodated us. Don't know how parking will be when the restaurant opens in a few months. Construction was happening when we were there yet one does not hear it at all in this condo. We stayed for eight nights and were only given one small bar of soap and a very limited amount of toilet paper. When my wife called the local contact person and asked for more, he initially stated that the condo gives enough to "start with", I thought that was very petty, I have never experienced that at any resort (been to Hawaii at least 10 times and have used Aloha Condos at least six times w/o a complaint). My wife was persistent and more was brought and the person checked with us to make sure we were happy, he was friendly.Overall, would stay here again w/o hesitation. The place does need a deep cleaning, such as the carpet and the cushions of the furniture, that is why only four stars yet the view is five stars plus. We had a great stay in this condo. Fit my mum, two young daughters (my older daughter slept on the trundle bed, with my mum on the upper part of the trundle bed in the living room) and my husband and I well (husband and I in the bedroom with the smaller one). Lovely view! Full kitchen was very handy as the CAD/USD is terrible so we ate in alot. Beach supplies (toys and boogie board) came in handy, so did the tennis rackets and balls. Swam in the resorts pool everyday! Would stay here again. Stayed in the same resort last year but in a studio condo with a great view as my mum wasn't with us and we had one less kid. HBR 7202 was amazing, and staying at non-peak season it was a great value as well. The highlight for sure was the huge balcony with comfortable furniture and an incredible view, as well as all sorts of wildlife making the rounds right near us to watch (nene, roosters, etc). The condo was even larger than I expected - plenty of room in the bedroom for luggage (including 2 luggage racks), plenty of closet space, more than enough room for the 2 of us. The bathroom looked brand new and had some toiletries as well as enough TP for our stay. The kitchen was clean and better stocked than any vacation condo we've stayed at - plenty of pots/pans, a salad spinner, spices, oil, vinegar, (even a stick of butter! but I'm guessing what is left by previous guests varies, it was just refreshing that useful items left behind by guests were left for the next guest...) paper towels, dish soap, dishwasher tabs, ziploc bags, foil, etc, as well as a lovely welcome gift on the counter from the owner and Aloha condos. The front closet had some great beach chairs that had straps so you could carry them backpack style down to the beach, as well as other beach/tennis gear. We enjoyed having AC in both rooms, as well as having a washer and dryer. (The dryer took longer than expected to dry stuff, though, and I realized there was no lint screen - and likely lint buildup in the vent - which I brought up with Aloha and they said they would fix it.) The walk to the condo was a bit steep (same goes for the walk to the beach). For us that wasn't a problem but I'm guessing it could be for some, although I did find it easier on the steep parts with my walking sandals than my cheap pool flip flops - and you can call for a golf cart pickup whenever you want (we used it for checking in and out with our luggage). The pool was lovely, and never crowded while we were there. It would have been a bonus if the restaurant and bar had been done, but we would come back and stay at HBR regardless. We really loved our stay at 7202 and when we plan another trip to Kauai, we will be checking availability at this condo first. Thank you for your glowing review of the unit 7202 at the Hanalei Bay Resort. It is a spacious condos and we do try to have everything you might need in your vacation. The beach chairs and boogie boards are always a surprise that are available in the condo making it so you do not have to rent them elsewhere. Of course the views are second to none and make the stay that much more enjoyable. Thank you for noticing the bathroom as it was recently remodeled and turned out nicely. The resort is on a bluff overlooking the Hanalei Bay, therefore the resort has different elevations as you go throughout the property. Thank you for pointing out that there are bell boys with golf carts available to call if you want a ride to the beach, the parking lot or the pool. We appreciate that you would call us first for your next trip and we look forward to serving you again. If you're looking for a great price to match the spacious AC conditioned condo, then this resort is for you. Beautiful ocean and mountain views to enjoy from your personal lanai. It's so quite that at times you can hear the ocean waves from the beach at night! The resort is quite and adult friendly. You may see a few children here or there, but it definetly felt like the saying "seen and not heard." The resort amenities were great. The staff around the swimming pool encouraged guests to bring their own alcohol beverages in plastic cups. The pools had a handful of waterfalls to swim under and after can relax in the hammock or lounge chairs to suntan. The tennis courts were an added bonus, along with the evening sunsets by the fire pit and tiki torches. On the property, there is 24 hr front desk service to pick you up via golf cart to whatever destination you need on site. You'll need this service when you use the resorts personal beach. Unless you like a brisk walk downhill under amazing jungle-like tree branches. This resort is the oldest standing resort in Princeville since the hurricane in 1992 (because of highest elevation). The property has original tropical tree (banana, lime trees, etc). Absolutely stunning! The room came additonally equipped with boogie boards, cooler, beach umbrella, tennis equipment, and beach toys for kids. Not all rooms have this, but we really appreciated it because we could make our food from home and take it with us on the road! Tip: Shop at costco for bulk items and you'll be set! Graham was great to work with, had solid recommendations for tours or anything we wanted to do and was responsive to our calls. The 7202 unit has an amazing view of the bay from the balcony where we ate breakfast every morning. Its a short walk to the lower bbq area where we cooked our lunches and some dinners and its also a short walk to the shared beach at the St. Regis. The resort is undergoing renovations but the majority of them were completed by the time we got there and didn't interfere with our building. Overall, beautiful condo, amazing location and you can't beat the value compared to other resorts in princeville. We'll be back. We had a wonderful vacation in beautiful Kauai. We stayed 1 week in Poi Pu and 5 days at HBR. Our favorite was HBR 7202. The condo is lovely with beautiful grounds, a million dollar view and a very comfortable bed. Everything was clean and in working order. Ac and washer drier a huge plus. The property management company was responsive, accommodating and very helpful to our every request. Great value! Would definately stay here again. Everything about the location and condo itself was just as it looked online. The condo was in a great location for relaxing and enjoying nature and was beautifully decorated. No fancy brad new appliances or bathroom, but the decor was lovely and all the basics were there. The view was gorgeous and we saw a rainbow almost every day just sitting on the lanai! There were an abundance of beach chairs and accessories for guest use inside the condo as well. I was only disappointed because the restaurant/bar and lobby areas were under construction and closed. The resort will be great when this is finished. As of right now, you can relax by the pool, but have to put up with construction noise as well as go to other resorts or into town if you want to eat out. If you like to exercise, this resort is also great, as there are a lot of hills and long walks to get everywhere (although the staff will be there usually within 2 minutes to pick you up in a golf cart if you don't feel like walking). It was also wonderful to run on the path near the golf course, which was beautiful and safe. Overall, this condo is in a great location, has a magnificent view, and will be a 5 once the restaurant and bar area is completed. We chose this room a second time because its so beautiful as is the view. The bed is very comfortable as is the trundle bed in the livingroom which my son slept on for a short stay with us. Resort service excellent. I mentioned in my review last year that the room needs a new Easier-to-use coffee pot. There are paper filters and also the plastic/mesh one which confused us because we Didnt know which to use. We wasted alot of coffee trying to figure it out. Also there is a mildew smell in the bathroom. Lights over kitchen counter flicker. The bathroom sink stopper doesn't drain well. If hooks were put on the bathroom & Bedrooom doors and in the closet, that would be so very nice for hanging clothes. These are simple repairs some of which we complained about after last year's stay and were not attended to. Thank you for your review and your return visit to 7202. You will be happy to learn we have just replaced the lanai furniture with bar height chairs and tables so guests can better enjoy the view, and have just ordered a new refrigerator which will be installed within a month. We have also repaired the lights and the drain and will suggest to the homeowners that we add the hooks you mentioned. Love this place...and thanks Kristen and staff. We love staying on the north shore and this building at HBR. It took us awhile to find this spot and get away from staying at Poipu Bay. This is a great location...wonderful views and very quiet at this end of the resort. Overall, the unit is in nice shape. It's a casual spot...not fancy...which is what we like. Hey, we're at the beach...and a great one at that. The owners are clearly making on-going investments in upgrades...all the bedroom furniture has been replaced recently, as have all the small appliances in the kitchen. The bathroom vanity also looks pretty new. Looks like it's an on-going effort. Kristen and her folks were great to work with...very responsive and very helpful initially responding to inquiries, confirming everything, and responding to questions just before and during our stay. Also, the HBR personnel were all very friendly and helpful. It sure will be nice when the resort's bar/restaurant is finished. We enjoyed the condo. Everything worked and we had no problems with it. Great view. It's a long walk to the parking lot. This condo was very well equipped with an excellent location and view of the North Shore. The beach located on the property itself was very nice and great for young children. The condo was packed with kids water toys and accessories. You needn't pack much for a stay in this condo! We'll be back for sure! The condo was very comfortable and furnished wonderfully. I cannot say enough about the view!! comfortable lounge chairs on lanai that we watched sunsets on almost every night. The kitchen has everything you need. There were beach chairs and rafts for the pool in closet. I would stay here again. The only bummer is the Registration area and restaurant are under construction so you need to go off sight for food, but the grills by the pool area are nice we grilled several time while we were there. Great view from the lanai! Our unit was very roomy and perfect for a family of four. The view from the lanai was incredible. We all loved the pool as well although we didn't spend that much time there. Beautiful location, good value, everything you need! My husband and I took a 10th anniversary trip to Hawaii. We stayed on Kauai for a week. After much research, we decided on Unit 7202 in Hanalei Bay Resort. The experience was wonderful. The unit has a well-stocked kitchen, beach chairs, and other nice amenities. The views are lovely and the stroll to the beach down the paved path is about 8 minutes (yes, I timed it) from the unit. For older folks, you should be aware that you can't park your car at the unit. So, when if you get groceries and things, you must call the drivers who have golf carts to help you with luggage, etc. They are accessible, so it is not a problem. Just something to know before you go. We liked the unit. It is comfortable and clean. The resort itself seemed to have a lack of employees (only one shuttle person most of the time) and many of the employees have been there less than a month. The loss of restaurant and lounge also is a big loss, as walk up food and entertainment would make it so we wouldn't have to go out for each meal. Only other concern is the excessive cleaning charge ($50 per day in our case). Other units in the same complex have a much lower rate for this service. Great view from lanai. Room needs some furniture updates, living room & lanai, as they were dated and worn. Front room window slates need repair. Well stocked kitchen. My husband and I stayed in Hanalei Bay Resort (HBR) #7202 for four nights. It is a one bedroom 1 bath unit with one of the most stunning views of Hanalei Bay, the mountains and waterfalls,"Bali Hai" and sunsets.It was hard to pry ourselves from the spacious lanai. The unit was very comfortable, including the bed. The kitchen was well stocked with everything you need. The appliances could be updated, but are still nice enough. We loved the fact it had two nice sized flatscreen TVs. The lanai furniture was very basic but had two round tables and two chaisse lounges. However there were a total of only 4 table chairs. Great for 4 people, but not if you have guests. The location in the resort is quite private. Being so private, it is a long way uphill to the large pool area and to the parking area. Not too bad,and a cinch for younger ones (we are 60) However,a quick call to the front desk sends a golf cart to pick you up. That service is also available to jet you down to the beach which is shared with the St. Regis. Gorgeous views from the beach and quite handy to grab lunch or a drink at the St. Regis pool area. Only small downside are the tips one should give to the driver each time. There is a phone down the hill to call for pick up at the beach. We utilized the pick up service. However, a younger person could easily walk up to the HBR. The restaurant and bar were closed due to a fire and were under construction. That was a big disappointment. And the pool's waterfall pump was not working so the pool was not its usual gorgeous self. This unit is priced very well compared to "like" units. The only downside was the daily $10 Internet fee and the daily $5 fee for "something". A resort fee of $25 for your stay is also an expense and the tips to the golf cart drivers (if used). There is also a charge for phone calls. So...We figure we spent an average of $25-$30 each day in addition to the basic rental. Overall, we totally enjoyed our stay. 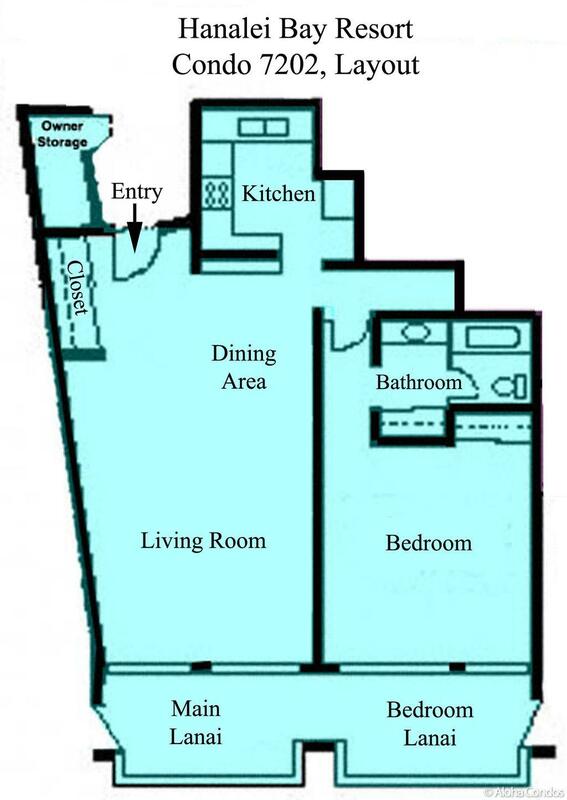 Pros - view (but most units in blocks 3-9 have great views), A/C, full kitchen, large rooms.2 closets in bedroom. This unit has laundry (stacked washer and dryer) and soap was provided. Resort staff were great, too - convenient golf cart service on demand (except once when they didn't respond to our request for beach pickup).We got enough towels for the week, and the kitchen was well stocked with cleaning supplies.Ample pots and pans, dull knives. The pool is large and there are plenty of chairs and palapas. No crowds on the tennis courts. Ice machines in the laundry building and an icemaker in the unit's freezer. Cons - uncomfortable king bed and noise from 3rd floor unit = poor sleep, kitchen cabinet doors don't close, kitchen counter is tile and a little grungy - we saw one roach. Small dated bathroom, and the trundle bed looked pretty bad. Lanai furniture is cheap (vinyl straps on aluminum frames - hard to get back up). Decor in this unit is very basic, no real Kauai feel. Long walk to the parking lot - be sure to call for a ride with luggage, groceries, etc. The common area laundry has 2 washers and 2 dryers -both washing machines were broken during our visit. Princeville is about an hour drive from Lihue. There are not many good restaurants (Dolphin in Hanalei and the Kauai Grill at the St. Regis were the best we visited). The max speed limit is 50 mph, but there are many slow zones for towns and road construction. Foodland in Princeville is a fully stocked grocery store, so you don't need to stop in Lihue or Wailua (but it's expensive, as are all Hawaii groceries). Best touristy thing we did was the helicopter tour of the island. After this trip, we decided we liked Maui better, and Mexico better than Hawaii (closer to us and cheaper). I had reserved unit 7202 over the internet months before our arrival. I arrived to check in late one day, after dark, and didn't realize I had a completely unobstructed view of Hanalei Bay until I woke up the next morning. Beautiful! The unit was spacious, clean, well stocked, and quiet. It is well maintained and the price was very fair for what was available. The only downside was that the wifi didn't work. Overall?...great. This unit is huge - the living/dining area has plenty of room to spread out without feeling cramped, and the bedroom is also quite large. The kitchen and bathroom are a decent size. I appreciated the "split" bathroom with the toilet/shower in its own room, so the sink/vanity/mirror could be used separately. Also, it was great to have a washer/dryer in the unit, which we used several times. The unit appears to have been recently remodeled, with very nice furnishings and appliances. The complex is great, convenient to lots of sights and activities, a nice walk (or shuttle ride) to the beach, with a beautiful main pool/spa, and wonderful lush gardens/grounds. We did not try the smaller pool, which is a shorter walk from the unit, because we just liked the size and naturalistic style (rocks, plants, waterfalls) of the main pool so much. All in all, a great stay and we'd be thrilled to stay here again. Great Stay - Highly Recommended! This was a great unit, and one of the most relaxing weeks we've had. Easy walk (or golf cart shuttle) to the beach, and don't miss the Dolphin Restaurant and Bar-acuda in town for dinner. We had a fantastic time and loved this condo. The views were beautiful. The condo was clean and well maintained. The beach supplies were a great touch. The condo complex was generally very quiet and peaceful (with the exception of several days in which a temporary utility pump of some kind was installed outside our unit). Awesome destination wedding & vacation week! This unit was a pleasant surprise! I stayed a week in Hanalei for a friend's wedding and it was really nice to stay somewhere that felt like home. It was great to have a full kitchen where we could cook and a great size living room & balcony where we could relax when we wanted to. This unit has a beautiful view which made the balcony even more pleasurable. Hanalei Bay Resort (HBR is what the locals refer to it as) is a great location on the North Shore. The two pools are really nice. It's a short walk down to a small beach and short car ride to other great beaches and fun adventure spots. There is a grocery store five minutes away as well. It was great that they had the cart service as well- you can call for a golf cart if you are in a hurry, have a lot of stuff to carry, or are dressed up in heels and don't feel like walking up to your car :)I am happy that I went this route instead of a hotel room at the St. Regis or the Westin. The HBR staff were very accomodating and had great tips and knowledge about the area. I have friends that live on the North Shore so I already had some inside tips of places to see and restaurants to eat at! (If you want a great, basic breakfast, check out "Wake Up Cafe")! The resort itself was quite beautiful, clean, well kept, and the customer service was excellent. The condo unit itself exceeded my expectations. It was extremely clean, stylishly well furnished, and very spacious. Having a washer/dryer and a fully applianced kitchen made my stay much more comfortable, my home away from home. The view was spectacular!! The room was vary nice and clean. It was an end unit so it was very private. The room had everything we needed to make our stay enjoyable! My only dissapointment was that the restaurant and bar to the resort was no longer in business. Although our unit was older, it was clean and about what we expected from the pictures. The grounds and the view was wonderful and the staff was very helpful. Disappointed that the restaurants were closed at this location, but there were several a short drive away. Relaxing, great views, serene, tranquil, easy access by foot to the beach, by car to the local attractions. Hey, where's my $250 deposit? Thank you for your positive comments. 7202 is certainly tranquil. Your $250 security deposit was an authorization only – not an actual charge. We only convert it to a charge if there are damages or fines. Of course, in your situation there were none. You took great care of the unit. The authorization expires shortly after your departure, so there is no charge to refund. I hope you will stay with us again.